This program is now in its pilot phase. We will only accept requests from teachers who have attended our Teacher Professional Development Workshops, participated in the electronics activity during Experience Science Day, or are registered UBC teacher candidates. Please sign up to receive email notifications about upcoming Pro-D workshops here. 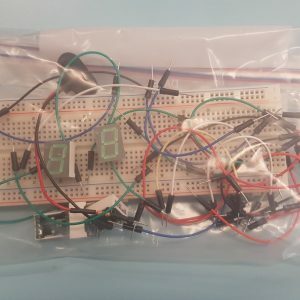 If you are a UBC teacher candidate, you can also borrow Making Kits via the education library. The lack of funding to purchase supplies for hands-on activities is a significant barrier for teachers to teach physics and climate change in their classrooms. A new program we are starting this year is “Lend an Experiment” – 25 hands-on kits have been assembled and put into boxes for local teachers to borrow. Each box includes equipment and exploratory material described in more detail in the list of materials and a list of possible activities. For additional experiment ideas, we also recommend visiting the following site. The goal for the LEx boxes is to provide teachers with the opportunity to delve deeper into the curriculum and provide enriching activities for their students. Teachers can borrow LEx boxes for use in their classrooms; those from Vancouver Downtown Eastside will have priority. Check LEx Box availability. Make sure you are borrowing the box when the box is availability. Fill out this form to submit a borrow request. Once the form is submitted, you will receive an email within 3 business days from outreach@phas.ubc.ca to arrange for courier delivery and pick up. Please respond to this email – your request will be cancelled if we do not receive a reply. Please note that as this is in its pilot phase as we are launching and making improvements to the program. Also, we would appreciate comments and feedback from teachers borrowing the kits afterward. Circuit Building: Grades 7 (electricity and magnetism), 9 (circuit building), 11 Physics (electric circuits), and 12 Physics (electrostatics and electric potential). Light Bulb Efficiency: Grades 5 (power and simple machines), 7 (electricity and magnetism), 9 (sustainability of systems),10 (conservation of energy and energy transformation), 11 Physics (power and efficiency), 11 Environmental (humans as agents of change), and 12 Physics (conservation of energy). Energy: Grades 9 (circuits and current), 10 (transformation of energy), and 11 Physics (power and efficiency). Climate: Grades 7 (natural selection and climate change), 9 (sustainability of systems), 10 (impacts of energy transformations), 11 Environmental, and 12 Environmental. See the relationship between voltage, current, and resistance – Ohm’s law! Discuss climate change and the ability of humans to change many aspects of our environment including climate. 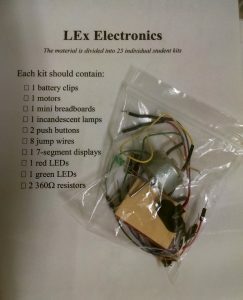 If you are interested in borrowing any of our LEx Boxes check the availability and fill out this form. We used the boxes for 3 sessions. It works best with students in partners. It was a fabulous experience. Thank you! 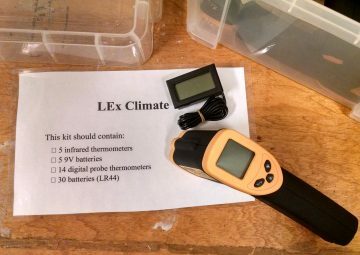 Teacher using the “climate” box with grade 6/7 students (science club) to discuss accessing data, finding unexpected results, talking about where on a building heat might escape. We used our LEx Box mostly with our Science Club. The kids loved exploring their environment using the infrared thermometers, and were particularly fascinated with pointing them at the sky to read the temperature. The Science Club allowed us to discuss our results and to field questions that we might like to explore in the future.